3.) Pumpkin Investigation Journal: Use this journal for a day of pumpkin investigations! 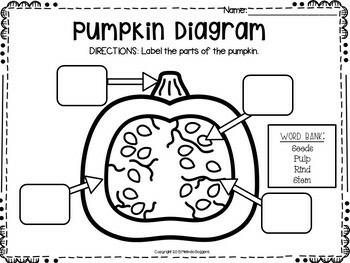 Classic activities include writing about a pumpkin, measuring a pumpkin, observing whether it sinks or floats, describing the inside, and counting the seeds. 4.) 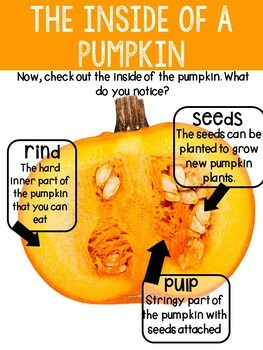 Pumpkin Seed Science: This experiment examines the question, "Does the size of a pumpkin affect the number of seeds?" Step-by-step direction for the experiment are included as well as a 6-page science journal where students will record their hypothesis, observations, data, and conclusion. 6.) 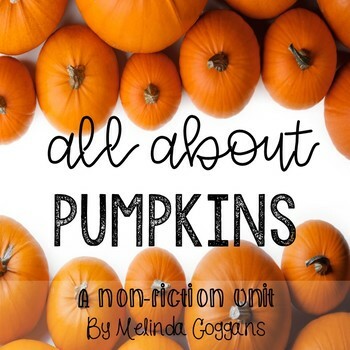 All About Pumpkins Research Report: Students will write about what they have learned about pumpkins and create an All About Pumpkins report. Writing papers, report cover (in both color & black and white), fill-in-the-blank diagrams, table of contents, and glossary pages are included. This could be used throughout the unit or as a culminating activity! 7.) 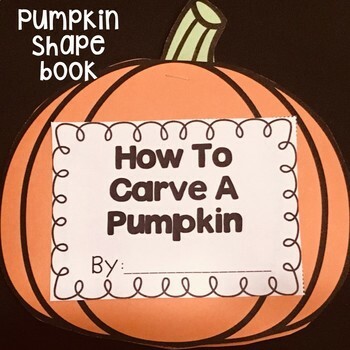 How To Carve A Pumpkin literacy activities: Sequencing cards, a matching emergent reader, cut & paste worksheet, writing graphic organizers, writing papers, and two versions of an adorable pumpkin shape book (1 low-prep option, 1 craft option) are included. Click on the preview link to see a small selection of what is included in this pack. Thank you for checking out my store!